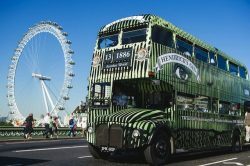 The delightful Hendrick’s Gin bus hits the Edinburgh festival next week. And who doesn’t want to climb aboard this unusual Hendrick’s Gin vehicle cunningly disguised as a giant cucumber whose aim is to improve public transport the length and breadth of the British Isles. H.E.R.B.E.R.T. (Hendrick’s Extraordinary Roving Bus for Exceptionally Refined Travel) will take passengers on a wondrous journey through Edinburgh between 8th and 14th August, between the hours of 16.00 and 21.00*. Tickets for the unconventional service are free but subject to a £2.50 admin charge and passengers can board at the Hendrick’s stop outside Bramble on 16A Queen Street, Edinburgh, EH2 1JE. The service will take approximately 30 minutes and pass by some of Edinburgh’s most famed sights including The Palace of Holyroodhouse, Edinburgh Castle and Arthurs Seat. Before you board here’s some information to make your experience even more enjoyable. With research by the curious gin maker revealing almost half of Brits (41%) cite bad etiquette from fellow passengers as their biggest frustration when travelling on public transport and 40% believing that summer is the worst time of the year to travel, H.E.R.B.E.R.T offers the perfect peculiar escape from bad manners, while enjoying a Hendrick’s & Tonic with a slice of cucumber, cocktails and cucumber macaroons. Hendrick’s has partnered with Debrett’s, the leading authority on social skills, to launch the Hendrick’s Gin Code of Travel Etiquette. The Code addresses some of Brits biggest annoyances and gives advice on how to exude tiptop travel decorum such as bulky baggage, public displays of affection (PDA) and the appropriate way to take a public transport selfie. James Field, etiquette expert and training manager at Debrett’s says: “As the trusted source on British social skills, we know maintaining decorum on public transport can be hard when you’re faced with bad manners, overcrowding and unavoidable delays. To help remind Brits of small courtesies they can deploy when in close proximity to others, we’ve teamed up with Hendrick’s to launch The Hendrick’s Gin Code of Travel Etiquette. H.E.R.B.E.R.T. is provided by Hendrick’s Ministry of Marginally Superior Transport; a bureau working endlessly to help remedy the ills associated with terrible etiquette across London’s transport system. Ally Martin, Hendrick’s UK Ambassador and Deputy Minister for Marginally Superior Transport said: “The transport in the UK urgently needs to get slightly better. Our bus, H.E.R.B.E.R.T, brings marginally superior transport to the worst mannered and overcrowded corners off the British public transport routes. With the help of Debrett’s, Hendrick’s Marginally Superior Transport is an establishment dedicated to solving transport problems with ingenious ideas, quips, and the odd cocktail. With a little consideration and a measure of good manners, travelling around town can be a pleasant experience for all concerned. Crowded transport can make even the sturdiest of us feel delicate at times, so try not to compound the problem by tucking into a smelly snack. Not everyone will share your enthusiasm for a double bacon burger with chips. Even making eye contact is considered forward on public transport, and full-on displays of affection can make others uncomfortable. If you’re travelling with a loved one, keep the canoodling for somewhere more private. Lugging large bags onto an already crowded carriage won’t make you popular with other commuters. Remove backpacks to free up space, and don’t monopolise an adjacent seat with your handbag or jacket – and especially not your feet. Avoid loud phone conversations on a quiet bus or train: others may not appreciate overhearing the intimate details of your recent night out, or worse, a Game of Thrones plot spoiler. You haven’t really travelled by Tube unless you’ve got a selfie to prove it, but try not to turn innocent bystanders into unwitting photo bombers by capturing them in the background. Personal space is at a premium on public transport. Refrain from (wo)man-spreading by keeping your legs together, and keep your elbows tucked in when reading a newspaper. You may be reluctant to offer up your seat to someone who looks pregnant, elderly or infirm in case they prove to be none of those things. If you notice a walking stick or Baby on Board badge, or anyone resembling your grandmother, make eye contact and move to free up your seat in case they want to use it. Whether it’s Bieber, Beyoncé or Bon Jovi, don’t assume others will share your taste in music. Wear headphones and keep the volume to below leaking level, and be wary of inadvertent humming. There’s nothing quite so tempting as diving between closing doors as the warning beeps sound, but it’s better to wait for the next train than to crush yourself into the fray. You’ll also avoid the humiliation of getting trapped in the doors – and the disapproving glares from other passengers. A quick touch-up of mascara or lipstick is acceptable, but refrain from full-on facial transformation. Some forms of grooming should remain firmly in the confines of your own home, including tweezing, squeezing and, for men, shaving or nose-hair trimming. Passengers can keep up to date with the Ministry’s quest for slightly better transport via the Hendrick’s UK Facebook and Twitter. Passengers are invited to share their travel woes (or triumphs) with a tweet to @HendricksGinUK using #HendricksMinistry. The best (or in some cases the worst) will receive a delightfully different Hendrick’s gift or personalised message from the Ministry.